Millions of people are facing famine in Yemen as importers are unable to have food shipped in after Western banks severed credit lines. Some $260 million is stuck in banks due to the civil war, trade and aid sources say. The United Nations said 10 of Yemen’s 22 governorates are currently in a phase 4, or emergency, situation. If an area reaches phase 5 famine is declared. Out of Yemen’s 28 million people, 21 million need some form of humanitarian aid and over half the population suffer from malnutrition, the UN said. 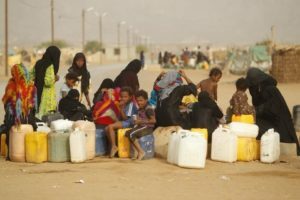 “Food imports have been going down which should translate into lower stocks,” said the UN Food and Agriculture Organization’s regional representative Abdessalam Ould Ahmed, who added that while Yemen had not reached phase 5 yet, there was nevertheless “significant deterioration,” especially in the city of Taiz. Western banks cut credit lines for traders shipping food to Yemen, fearing they would not be repaid due to the security chaos and fragile financial system. Now, they are increasingly unwilling to offer letters of credit, which guarantee sellers will be paid on time. “This problem is getting worse and no Yemeni bank can transfer money out directly. They have to fly funds out to the nearest country and make deposits in accounts abroad,” an international commodities trade source said. The UN said a famine is declared when at least 20 percent of households in an area face extreme food shortages with a limited ability to cope; acute malnutrition rates exceed 30 percent; and the death rate exceeds two persons per day per 10,000 persons.